Roller blinds are the most popular of our entire interior blinds range, and our electric roller blinds are the perfect addition to the modern home. Available in a wide range of beautiful British-made fabrics, our electrically operated roller blinds not only look fabulous, they can be opened and closed at the touch of a switch, a remote button, or even an App. Our electric roller blinds are all made to order, giving you complete control over the design and control features. Whether you are looking for a screen to maximise privacy, a window dressing with a vibrant pattern and easy control, a blackout blind for light control, or a remotely controlled blind to assist with the temperature in your home, all of our roller blind systems have many options to make them totally bespoke in style and operation. No matter what size your windows, we are sure we can help you gain perfect control of your home and make them look fabulous with our premium electric blinds. We are able to produce electric roller blinds from as small as 340mm up to 4500mm wide and drops as large as 4000mm. As far as we are concerned, no job is too big or too small. We offer over 4,000 fabrics ranging from voile and screen to pattern, blackout and prints. Whatever colour, pattern or texture you are looking for, we have the fabric to match your requirements exactly. From muted, serene plain fabrics to those with party popping colour prints, and everything in between, you’ll be amazed at the fabric choices we are able to offer. Our fabulous fabric ranges include Amo, Louvolite, Eclipse, Dutton & Gavin, Mermet, Fabric box, Aquarius, New House textiles, Decorquip, AR Irwin and many more. If there’s a particular fabric you are looking for, talk to us. We are sure we can help. Speak with us about special treatments on fabrics such as anti mould, Fire retardant, moisture repellent and our latest “Pollergen” fabric for collecting pollen particles. Whatever your requirements, we are sure we have the perfect fabric and colour palette to suit you and your home. All blinds are matched to the tube diameter based on the size and fabric weight. We are pleased to offer the hardware (Brackets, fittings and fascia’s) for our blinds in 6 standard colours, as well as the option of special colour matching to your chosen fabric. The finishing touches to your blind can make all the difference to the end result. Why not make your blinds stand out from the crowd? The finishing touches matter as much to us as the blind itself. We want every bit of your blind system to look and fit perfectly. Our exciting control movements put you completely in control of your window treatments at the touch of a switch, a remote button, and even from your smartphone or iPad. 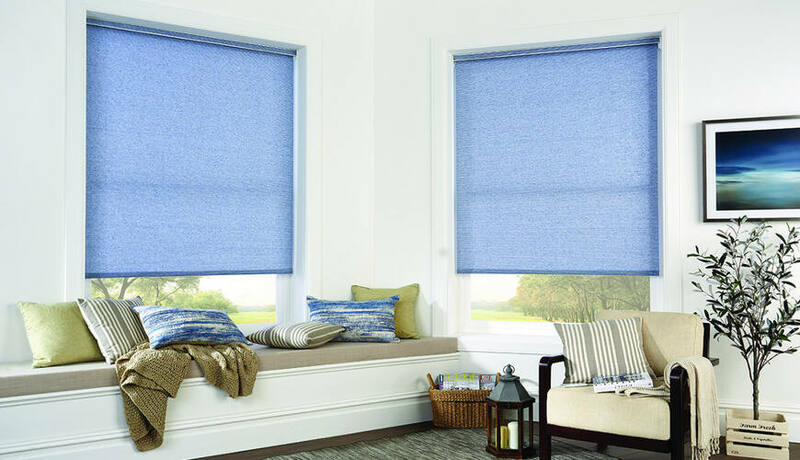 Control your privacy, light and temperature preferences by setting your blind at the exact position you want it to be at any time of day or night. The popular Somfy® RTS system allows you to operate blinds on a timer and from remote controls from virtually anywhere inside or outside the home. Simply plug in the RTS receiver and blind control is in your hands. It’s that simple. Our full selection of power and control options also include solar, mains supplies and battery controls.
. The choice is yours. As an experienced manufacturer we will offer valuable guidance to carefully match both the motor and control option to work perfectly with your design requirements. For all of your window covering needs, get in touch with our friendly team of professionals today. We offer over 30 years’ experience in the supply and fitting of luxury blinds. We’ve invested in high quality manufacturing equipment to keep us at the forefront of technology, so we guarantee blinds of superior quality. Let us transform your home with a blind solution that ticks all the boxes. Call us now on 0800 953 0199, email us at info@aqblinds.co.uk, or come and see us at our showroom for inspiration and chat to one of our experts. With Aquarius Blinds, installing electric roller blinds couldn’t be easier.